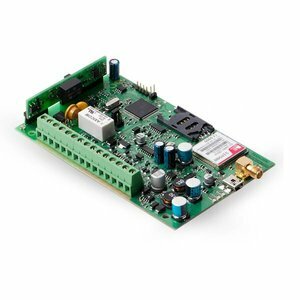 Universal GSM Comunicator 3 inputs, 3 outputs Optional ET08P enclosure Optional EPSTN1-08 module Compatible with ELAN3-ALARM Ethernet Communicator. ET082 is a universal GSM/GPRS, PSTN, LAN gateway/communicator, which expands any PSTN intrusion alarm panels functionality and adds communication channels. The panel can then communicate with alarm receiving centers and directly to home owner, as well. ET082 provides communication channels for any third party panel (GSM/GPRS, LAN and PSTN). Lets you control the panel using SMS/Call. Monitors all data transmission channels. Transmits selected protocols to alarm receiving center. Simultaneously transmits signals to multiple alarm receiving center servers. Expands existing panel with additional zones and PGMs and notifies home owner via SMS or voice call.